Being handed a bunch of fresh flowers tells you you’re loved and makes you feel better; flowers look beautiful, and it’s been shown that having bright and lovely flowers around you is even good for your health. The only downside is that flowers don’t last forever, but don’t despair – there are plenty of different ways to use your wilted flowers. If you’ve just bought your flowers, there are also some practical and easy ways for you to extend their life for as long as possible. If you’re buying the flowers for yourself, make sure you’re buying healthy ones. Squeezing the base of a flower can give the game away, so if it’s very soft, it’s not very fresh. Buying from refrigerated storage buckets will also maximise the chances that your flowers are fresh. Plan ahead and have some damp paper towels with you that you can wrap around the stems for the journey home. Make sure you have a range of clean vases on hand so that you will have something suitable, no matter what you are gifted; adding some small, clean stones at the bottom will ensure it doesn’t topple over. Don’t forget to change the water regularly, and consider buying some commercial flower food, which can be easily stored and dropped into the water when you need it. Regularly re-cutting the ends of the stems at an angle means the flowers will be more able to draw up fresh water. 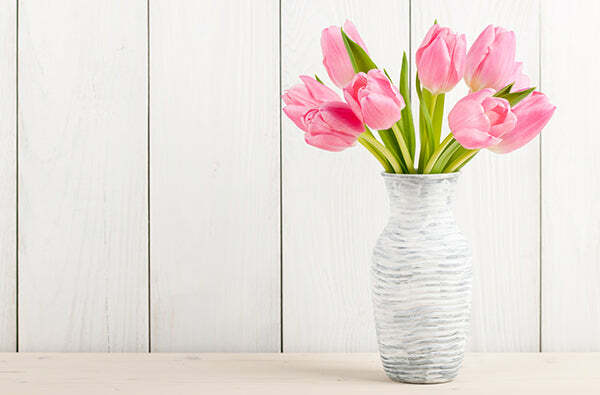 Adding a small amount of sugar, soda, vinegar, bleach and even vodka to the vase’s water supply is good for the antibacterial qualities of the water and the flowers. Another secret is to crush up an aspirin tablet and drop it in. Have a few of those old one and two cent coins lying around? The copper is a great water acidifier, so add those too. It sounds silly, but just as hairspray will preserve your hair for a while, it will also keep your flowers looking healthier. Focus on the petals and the undersides of the leaves.